It feels like just yesterday that Microsoft had blessed the internet with its new search engine, Bing, and today we mobile addicts have access to this service on our phones. If you head over to m.bing.com on your handheld, you’ll find yourself on a lite version of this Bing’s titan service. So does this compete with the Google’s mobile service? Not just yet, and it seems that Microsoft has omitted all those fancy features that has made Bing a near-overnight success. An ambiguous Web search: “turkey” – Does not offer any disambiguation, gives me a map of the country and a few images of that delicious holiday bird. On top of that, the specific search set my location as Turkey. A travel search: “SFO to JFK” – Nothing in relation to helping me book a flight, just some pictures of the aforementioned airports and a few travel sites. Image search: “Rollercoasters” – The image search on Bing Mobile is very similar to Google’s mobile image search, nothing too special here. A health search: “Sore throat” – Mobile Bing felt that my sore throat query was actually a news search about swine flu. Shopping: “Digital SLR” – This was actually pretty sweet, gave me very similar results to Bing native search. Maps: “BBQ” – No awesome map support, just a whole lot of awful clipart images. News Search: “Bing” – Well, news search is right on the money with this mobile engine. 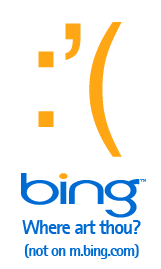 Bing web service: Awesome; Bing mobile service: Mediocre. It’s understandable why they rushed their mobile product out the door (presence is key), but for goodness sake, Bing’s special features are what won me over. Until Bing mobile is up to speed with Bing’s web engine, I will continue to stay true to the ways of Google for mobile search.